This stunning Exhibition is part of a series run by Cupola looking at art and our relationship to the environment. I could not have been more pleased to see my sculpture thoughtfully and expertly set with gorgeous paintings from 3 outstanding artists. Cupola Contemporary Art’s award-winning Gallery is one of the UK’s most established. They are welcoming, friendly and hugely helpful. No heavy selling or rushing. They will give you knowledgable guidance and support to help you find the art-work that really speaks for you. It is clear they are genuine: they love their gallery and the creative process. There is a wide choice of materials, styles and prices including beautiful unique and affordable gifts like un-framed drawings or prints and jewellery. Cupola looks after their artists so they get our very best work. They encourage us to take risks, try new things but they never push for ‘sellable’. With their very loyal, customers are looking for sincere art, real communication. “Cupola Gallery brings together 4 artists who deal with landscapes. The exhibition will feature 3 painters and 1 sculpture. The 3 painter’s distinct styles embody a meteorological exploration of the landscape shifting moods and seasons fluidly from painting to painting. The painter’s fluid approach is complemented by Rebecca Bucks almost geological sculptures, the predominantly black and white ceramics embodying the land itself. Paul Evans takes inspiration from the modernist canon of Abstract Expressionism and Art Informel. 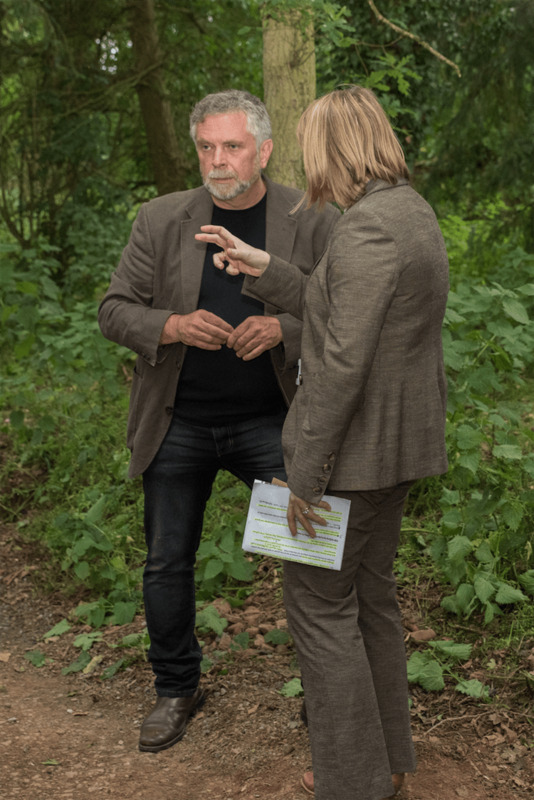 Paul work explores aspects of our physical and emotional relationship with nature something that he consider to be ‘a complex response to a complex field of interactions’. Alison Tyldesley’s work aims at capturing movement, intense light and atmosphere – particularly glowing horizons, wild skies, receding hills and textured foregrounds. Her paintings are not always depictions of a particular scene, although she cannot help her work referencing the peak district she immerses herself in. John Bainbridge practice is strongly rooted in the Northern Pennines. The rich colour and texture of the land is enhanced by the Pennines’ unique quality of light and the atmospherics of seasonal wind and weather. The paintings try to reflect the close contact he has had with the land through fell running in all conditions, day and night! 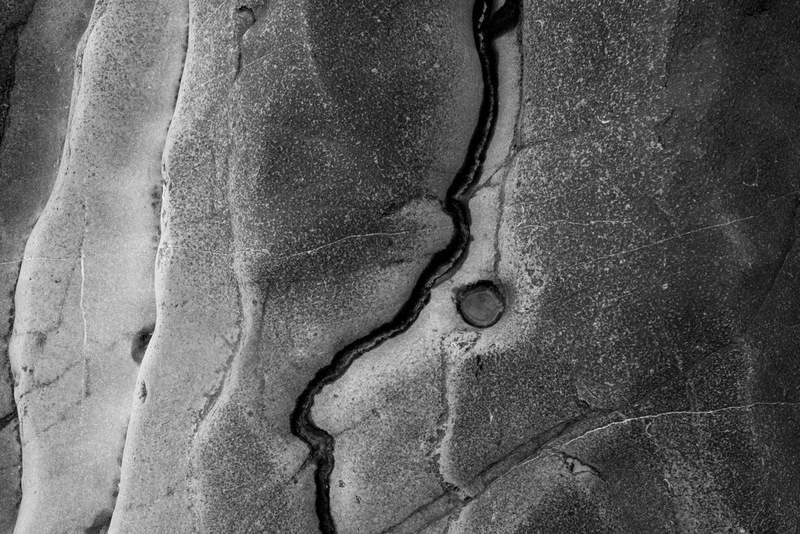 Water and Stone, Bracelet Bay, 2014, 24cmH x 56cm L x 33cm W, Marbled architectural ceramic. Photo by Stephen Foote. Rebecca Buck’s sculptures deal with the landscape on a geological and spiritual level. Fascinated by climate change Rebecca’s ceramics are a combination of roughhewn textures and polished smooth surfaces, as if the clay had been less formed by hand but from the erosion and weathering of the elements.” Karen Sherwood, Cupola Gallery Owner. I have 14 sculptures in this inspiring, intense Show including new pieces hot out of the kiln that I havn’t photographed yet. Arctic Harbinger, 33cm L x 13cm H x 12cm D.
Guardians of the Valley, 30cm H x 67cm W x 26cm D.
Wyvern IX, 14cm H x 38cm L x 15cm D.
Over Half A Century II. Up is Down VI, second view. Photo by Stephen Foote. To get the best out of our modest budget we used some new techniques and on my 1 year maintenance visit to this the lovely site I was hugely pleased to see they have worked really well. Despite a very harsh winter the sculpture looks fresh and is weathering in a uniform, gentle way. The moss is slowly collecting in the deep textures as planned. 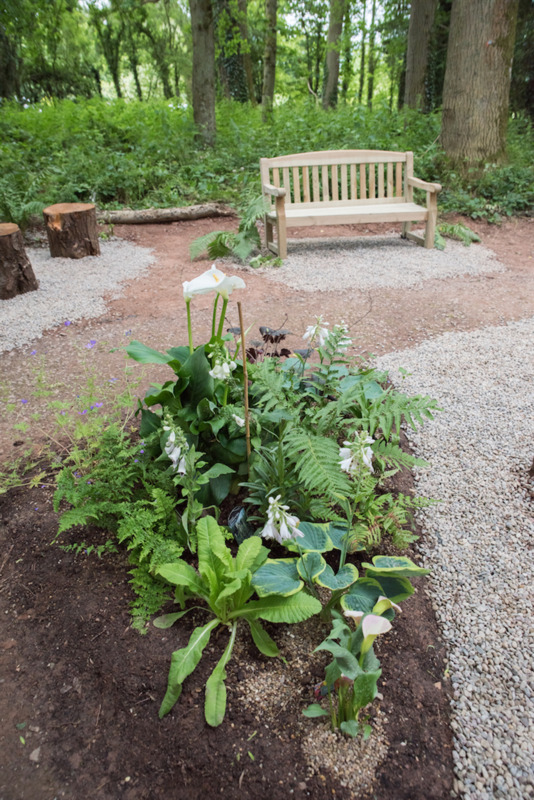 The lovely, thoughtful planting has re-grown beautifully, complimenting the form perfectly, softening the site and integrating it into the lovely woodland which is overflowing with flowers and birds. The paths are still level, easy for patients to use and now look like they have been there forever. While I was there working a lot of people strolled by. They said this had become their sanctuary, a moment of peace and escape from the pressures in the hospital, where they could revive. This is exactly what we wanted. A wonderful result. Everyone is welcome to visit this stunning spot at Bronllys Hospital grounds in Powys, Wales. You can read the whole story of this wonderful project, including how the sculpture was designed with local people and built at Osprey Studios, in the other Marking Time posts here on this site. We animals are frequently surprisingly similar and identifying those differences can be really difficult. Furriness or our perceptions built around our relationships can confuse the information and make it hard to see. Skinny legs supporting big bodies or building on larger scale where the weight of the clay is a huge issue cause a lot of problems. This is the same technique I now use for making heads. A simple clay armature supports the weight throughout the build and gives you a central point that you can work outwards from, allowing that most important key to success: making loads of mistakes and fixing them. You get to avoiding hollowing out so that you can play around with textures while you are building. And you will be using the process to re-organise the information in your head: there is no better way to do that than hands-on. The skeleton is a stick-figure with the proportions (so important when you are being species specific) set out clearly and unambiguously. Fur, muscle shapes changing with the pose and fore-shortening in photos can confuse leading to sculptures that are cross between lifeless amateur taxidermy and stuffed toys. The key reason making forms from life is so hard is that the perception (the way we take in our knowledge) that we have built up over our lifetime of what shape the thing is, is based around our general experience of that animal. Making a sculpture of that living, moving, person requires going against what ‘feels’ right and using information we are unlikely to have bothered with before. Portraiture has a system to organise the huge quantity of subtle details. Learning this system will broaden your knowledge, and your access to more knowledge, enormously. That’s why the study of Portraiture and Figurative Sculpture is traditionally the bed-rock of Art. The more you practice these invaluable skills the more you will see improvement in all your artwork, your general concentration and your ability to see. Like a pianist ‘doing scales’ you will build up the small muscles, motor-skills and neural pathways involved in this challenging, rewarding activity. It is not rocket science and you can do it. 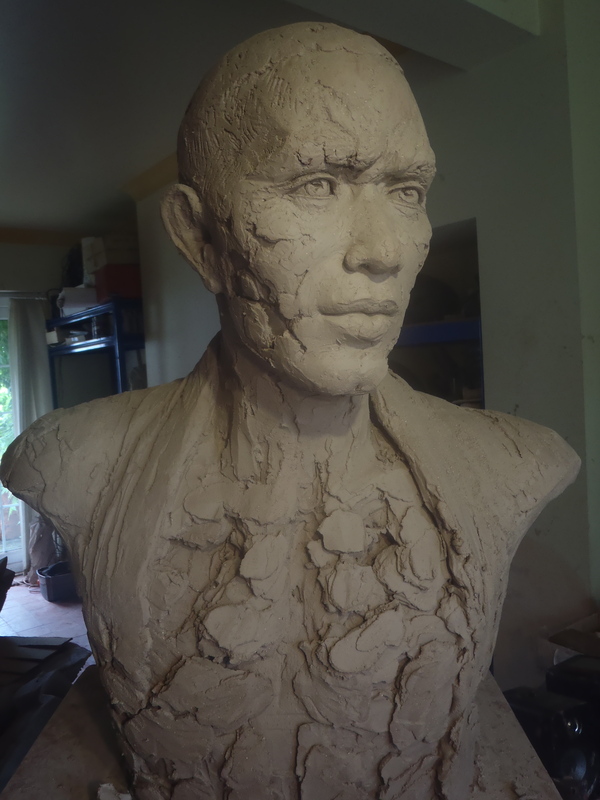 Because clay shrinks as it dries and is floppy when very wet a Clay Armature that will support and shrink with the form through the drying and the firing is invaluable. Most techniques for building hollow have a strong ‘voice’ of their own and will influence the final look of the piece. They can demand that you harden lower sections before you can build upwards and you are then unable to change them when you later realise they are wrong. This is a real disadvantage irregardless of your skill level. It is better to work solid over a clay armature especially if you are not using a scale-model and hollow out just before finishing touches. It’s not difficult. That technique is detailed here: Working solid and hollowing out. Working solid is an excellent method. You set aside the ceramic need for certain thicknesses in the clay until you are sure you have the best sculpture you can make at that point. The armature holds the weight up. Some areas can be built hollow too. I was really lucky to run this workshop over two days at the wonderful North Devon Ceramics Academy and Studio. 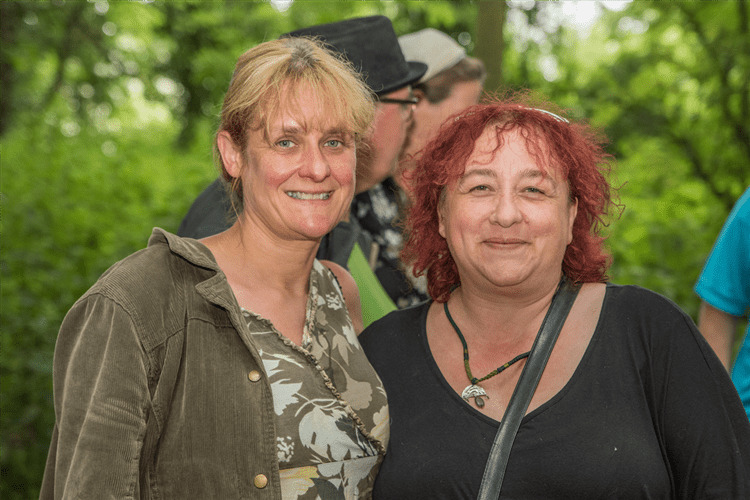 Nicola Crocker and Taz Pollard have created a fantastic, fun, supportive and practical space for learning and sharing creativity in clay. I absolutely love teaching there. 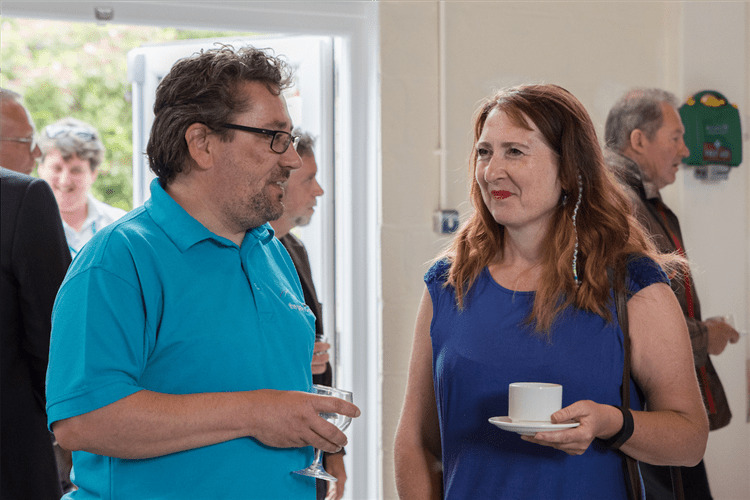 Nicola and Taz have a very genuine commitment to empowering other people and sharing their open and imaginative approach to the vast potential within ceramics. The Studio is spacious, bright and comfortable and the atmosphere is friendly, unpretentious and very encouraging. This amazing group of all experience levels were a joy to work with. And they came up with some great improvements to the technique. You will also adapt it to suit your hands and ideas. We are using the out-standing Scarva ES50 Crank clay (a stoneware clay with a lot of grog – ground up ceramic grits- in a variety of sizes from corse to dust making it much easier to hand-build with) because of the way it reacts with water and it’s superb strength when hard and also when dry. You can use different clays for the armature but using the same one means everything shrinks at the same rate during drying and firing. 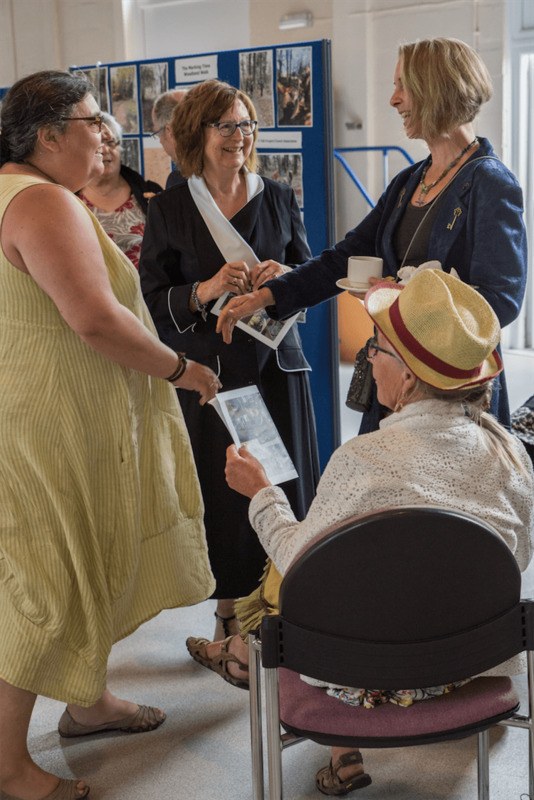 Many thanks to Nicola Crocker for the great photos of the workshop. Print out skeleton images of your animal, ideally in the same scale as you wish to make your sculpture, images of the whole animal and images of that animal in the pose you want. On to a stiff slab that will be your central support, carefully draw the skeleton. This is an important opportunity to get your head around this animals construction. You can trace through the skeleton using pin-pricks or pressure. But measuring from the diagram to transfer the image will begin the process of clarifying your knowledge of the animal for the purpose of sculpture. The skeleton is set clearly in a simple to read pose. The sketch is the pose desired. On the clay slab the skeleton is set in the pose. This is not easy to do, takes time and is a huge investment in your sculpture’s foundation and in your skills. Using stiff slabs, stand your central support up ensuring it is nice and stable. Make good joins: while much of this supporting armature will be cut away eventually some of it will remain and be useful during the firing. Build outwards using images of the animal to assess the widths. Use comparative measurements: the ribcage is twice the width of the head etc. A narrow standing figure like a meercat will need something to support him or he will be and almost worst, look, very fragile. In the figurative tradition acceptable motifs are employed: think of those little shrubberies at the ankles of classic marble nudes. Or you can add a second figure and get support, a fascinating narrative and lots of fab negative shapes into the bargain. Supports can added and removed all through the process. This wonderful student, herself a teacher came up with several practical and useful ways to improve this technique. If you are comfortable doing it, build hollow. Or add the clay on solid. At this stage you are still building the frame-work for the sculpture: disciplined measurements will give you a great foundation that will give life to the artwork stage. This piece is all about the energy and character of this squirrel. The ‘fluffy tail’ can be a meaningless cliche and has not been used here. Work right around the form in layers giving full attention to the whole sculpture at each rotation. It is extremely important that you are always will to cut off parts that are wrong no matter how long you worked on them. A beautifully crafted eye will look grotesque in the wrong place. Once your form is completely ‘ blocked out, with all proportions correct switch to using tools to apply the clay rather than fingers. You will get a more attractive, stronger surface and can be more specific. A good habit is to go all around adding. Then all around subtracting, repeat until you can’t see what else could be done better at this point in your progression. Then hollow if necessary. Then do finishing touches (with small tools) Then poke a needle hole into any area that might contain trapped air. Add other types of supports if useful but remember they wont shrink with the form during drying. Making birds is notoriously difficult because of their insane relationship with gravity. Work slowly in stages allowing the parts to firm up and add to the support system. Remove your clay-armature cautiously in small stages. This flying bird will be set on a base as yet un-determined. The armature holds the pose well on this very tricky piece allowing it to change and develop. This flexible technique can take you places you had thought of. Here the internal space has become part of the sculpture. Because the weight is supported and the skeleton provides strong boundaries you can play and feel your way around the form. The finished piece will need it’s own supports but here you can try various alternatives until you are happy with the look, strength and feel. Lots more trial and error will happen to this fascinating bird-scape in the next weeks. Take breaks, look out side to clear your eyes then glance at your sculpture and note what you first notice. If you hit a wall with it cover with a bag and walk away! I sometimes leave sculpture wrapped for months. I check regularly to mist with water and see if I can move forward again. Taking photos can be a good way to get some perspective. Ask others ‘what they see’ and compare that to what you want them to see. A dog that looks like a donkey has too big a head for example. A wonderful form where negative shapes play a stunning role. Their grace and movement is enchanting and very tricky to capture. Five points of contact with the ground could give this piece stability but at this small scale those legs and feet are still so small. This elegant solution, where the central support is tidied up attractively and immediately becomes neutral, eliminates the distracting fragility. This animal is iconic and has held it’s place in art for Millenia. It’s bulky form and thick fur can easily be over generalised into a blob on sticks. Here the skeleton secures the integrity of the structure. This sculpture is about his power and movement. This piece will be completely cut away from it’s supports once it is firm to retain it’s shape, rested on foam and a hole made for a metal pin and base that will show off it’s galloping form. The details of the face should be in balance with the rest of the sculpture. At this small scale it is also a mistake to try and put on complicated detail. It will take a lot of time to find what can be left out. The skull will give you the clues: it is the structure of the face that matters. Cats are extraordinarily flexible and their exterior hides their structure. Making pets can be very difficult because we have so much knowledge of them that can cloud the sculptural information. Use the skeleton to keep on track with proportions that our nutty perceptions may think are similar to humans! A beautiful, gentle way to address the eyes expressively in keeping with the form. This student had gorgeous pictures of her adorable young dog, especially his loving face. But at this small scale she focussed on his movement and energy to portray him. She will paint his distinctive markings on in colour. Keep re-checking those measurements at every stage. The armature is cut away (but continues to function usefully inside). Needle holes will be poked up into the form to vent all the air pockets made by building hollow. Then a hole will be placed for a wooden dowel set in a base to display this dog leaping as he runs. These little guys have tiny feet and very slender legs. You could build some grass or rocks around their lower legs to give stability. Or add a friend. Like the giraffe parts of the support wall could remain and no-one would notice because the charm of these characters and their friendship is far more engaging. This up-right stance gives similar problems to the meercats but the way otters stand gives plenty of attachment to the base. An otter’s simple form can be very difficult to capture. His gesture and poses are well recognised so that helps. Starting with the skeleton puts the key points of his body in the right place under that silky fur. There is a lovely change in loose to very smooth modelling on the surface that recalls water running off the fur. Like many big herbivores horses have surprises in their skeletons that are key to their shape. A rig of spurs along the spine limits over-flexing but also keeps predator teeth away from the precious spinal column. It defines their characteristic silhouette. The skull seems bizarre but get that blocked in well and the head will look great, even in a small scale. Follow the transition points of the legs very carefully. Note how those big neck muscles cross and attach behind the shoulder blades. At this stage it is almost as if the legs are just attached to the edge of the body but you now know those leg bones go right up near the spine and have a wide range of movement which can be gauged by measuring the length of a bone and pivoting it from it’s socket. It was suggested that you could cut up a spare skeleton in order to make a hinged ‘shadow puppet’ that could be helpful in designing the pose from a standing skeleton. These guys go well above and beyond not to look like animals all! They have extraordinary skeletons, well worth studying. But it has to be said that apart from proportions the hard shell-like outer skin means you see no clues of it showing on the armadillo’s surface. Their shell is a very subtle, beautiful shape with exquisite patterns. This student did all the skeleton work as part of the workshop. But then he switched to working solid/hollowing out as a technique far better suited to armadillos. On solid clay use your skeleton to identify the right proportions. Use a serrated kidney tool to shape the body. Then use a flat wide modelling tool to add clay and further refine that gently undulating form. Your central, weight-bearing support does not need to be flat/straight: Both of these abstracts were built outwards from a stiffened curvy up-right central shape of various thickness set on a metal rod. Antarctic Leviathan, 45cm L x 23cm H x 12cm D.
Genuine joins are formed when the chains of platelet-shaped particles from each section inter-lock. Picture a magnified image of hair. Score marks do not give the surface ‘tooth’; they allow water into the clay-body. On vertical surfaces they hold the water in place to give it time to sink in. Slip is not ‘glue’, it is clay particles spread out in water and has little strength, especially when it has dried. It is ideal for holding a lot of water in place to give it time to be absorbed to soften the area of leather-hard clay. Once both edges are softened put the pieces back together and move back and forth until you feel the edges lock together. Manipulate the softened clay at the join to encourage further integration of those particle-chains and to disturb the straight line of the join; cracks love to zing along a nice straight slip-weakened join during the firing when the pull of shrinking stresses the sculpture. How thick the clay can be to fire well depends on the amount of grog (the gritty bits of pre-fired clay ground to specific sized grit/dust that gives improved structure and resilience to your clay), the denseness of your modelling style, drying time and the speed of your firing. Air bubbles trapped in the clay will expand with the heat. Grog and/or a loose surface will allow the air to seep through the clay. The same is true with water but steam expands fast. If your piece breaks into big bits during the fire it was trapped air and you will be able to see where the bubbles were in the shards. If it blows up into a trillion smithereens it wasn’t properly dry! I dry thick sculptures slowly under plastic which I turn inside out ( to avoid condensation pooling) daily for 4 weeks minimum and then 1-2 weeks in a plastic tent with a dehumidifier. A card-board box makes a great, slow, draft-free drying chamber.A long dry allows the water to level out as water loves to do and that will enhance the structure of the clay within it’s new sculpture shape. You will get less cracks or distorting in the fire. I fire very slowly with an 18 degree C rise until 600 degrees C. then onto full power up to the desired temperature. Generally 3cm is a fair maximum thickness for a well grogged clay. There is good essential advice about handling clay on the post about Coil Building. How To Make a Head is essentially the same method and you will find it helpful. It talks about human heads but of corse is relevant to all heads apart from the handy option of being able to measure with callipers from your own. I have been following the fascinating progression of Climate Change for 35 years. At last it is a main-stream subject. It’s intriguing how a small number of people are still trying to avoid seeing it, the deniers but mostly the avoiders. It is terrifying, lethal. Our doing and responsibility. The prospect of shifting the habits and habitats of our gigantic population is exhausting. And it is also thrilling: nature rejoicing in it’s power and spectacular magnificence, the wonder of transformation. A fabulous drama that will inspire our greatest creativity and resourcefulness. Antarctic Guardian II, 62cm H x 29cm W x 37cm D.
A Myth is a sure-fired, time-honoured way to ease people into new ideas. A bit of good ol’ anthropomorphising helps people to relate. And anyway it’s how my mind works, ever the animist: Like a great many others, I see the characters in the natural world very clearly. So a narrative has slowly emerged from the progression of sculptures (rather than the other way around), beginning during The Landscape Series. I wont interfere with that. I will record what I see, let the clay take the lead, research areas I need more information on, add music and follow the road. This is how I have always worked. But this time there is far more clarity. Antarctic Harbinger I, 20cm H x 33cm L x 19cm D.
A trichotomy of the Earth, the Guardians of the Aquasphere, the Lithosphere and the Atmosphere arose and they, and their Sentinels and Harbingers took on characteristics that the many life-forms of the Biosphere could relate to so that all would understand what was happening; They were going to let loose their forces. This was not to threaten or punish. They simply knew it was time. Arctic Guardian and Harbinger, 70cm H x 37cm W x 24cm D.
The three spheres cover all that is water, stone or air. At first that seemed simple. But the three over-lap all over the place. And combining with sunlight, they build the whole of the Biosphere that they nurture and threaten. 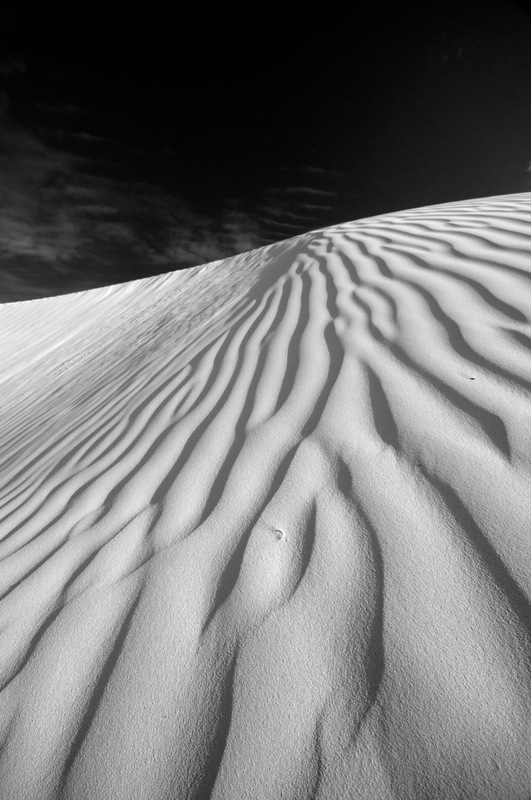 Steven Foote’s stunning photographs from The Landscape Series seem to contain the whole mysterious narrative, characters and all, I refer to them daily and they will continue to be the bed-rock of the Series. 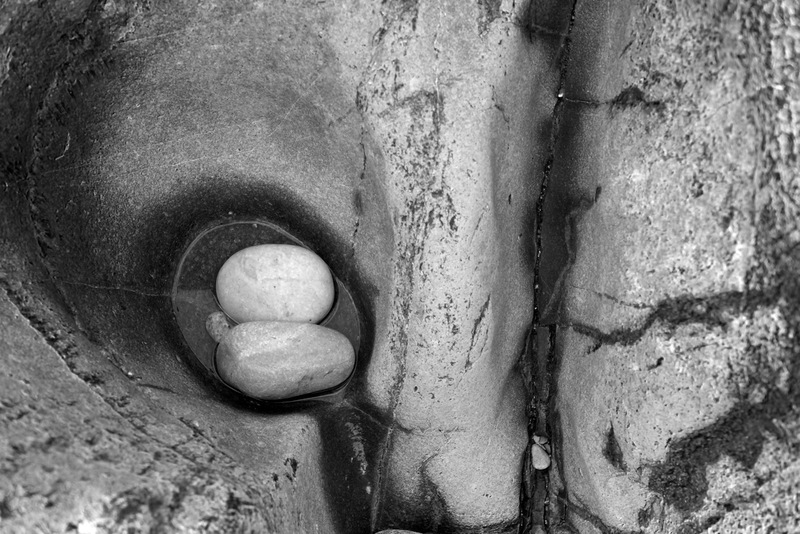 The key there became the beautiful, evocative forms left by water as it passed over rock and the land, an echo of it’s own shapes. This, coupled with intense news from the Antarctic about accelerated melting and glacial movement has kept my focus particularly on the Aquasphere. It is changes with water that cause the most upheaval to the Biosphere. Water holds centre stage in the atmosphere’s massive weather events. More often than not it is at the forefront of dramatic episodes in the lithosphere: mud-slides, sink-holes, erosion and sometimes the provocation of volcanos. Water takes so many forms: flowing (fresh and salt), vapour, ice. Each has a range of characteristics. The primary character is the Leviathan but there are many others involved. Antarctic Harbinger II, 13cm H x 26cm W x 14cm D + base. Mountain River Sentinel, 69cm H x 39cm W x 28cm D.
Coastal Harbinger II, 43cm L x 29cm H x 22cm W.
Mountain River Harbinger, 37cm L x 21cm H x 19cm W.
Coastal Harbinger, 35cm L x 23cm H x 16cm W.
Leviathan IV, 35cm H x 61cm L x 29cm D.
Mountain River Guardian I, 36 cm H x 67cm L x 42cm D.
Leviathan IX, 35cm H x 60cm L x 25cm D.
Leviathan II, 2015, 53cm H x 79cm L x 36cm D, ceramic. Leviathan II, detail, 2015, 53cm H x 79cm L x 36cm D, ceramic. At first I was seeing atmosphere simply as sky. Weather, especially the fabulous, awe-inspiring kind like hurricanes. But the atmosphere is every where, filling every gap, breathing life into the world, even under the ocean. For this reason the Osprey is it’s main form. Antarctic Osprey II, 39cm H x 50cm W x 50cm D.
Osprey IX, 13cm H x 18cm W x 11cm D +base. Antarctic Osprey I, 12cm H x 46cm W x 13cm D +base. Antarctic Osprey III, 17cm H x 57cm W x 32cm D.
The Lithosphere, the geologic, stony part of the world has The Wyvern, a shape-shifting dragon that has taken a number of forms so far. Antarctic Harbinger and Sentinel, 28cm H x 17cm W x 13cm D + base. Wyvern XI, 13cm H x 20cm L x 16cm D.
Wyvern, 11cm H x 15cm L.
Wyvern X, 12cm H x 21cm L x 11cm D.
I started looking at forms and ways to describe the Biosphere’s part of this story. ‘The Land’ sculptures started in The Landscape Series but this was different: it was no longer just the form and far more the theme of vulnerability. Change in the Natural world is wonderful, a miracle. Frequently spectacular. And terrifying, heartbreaking, sometimes to dreadful to countenance especially where the Biosphere is concerned. But there is also belonging, the perfect fit of life grown out of the combined trinity of spheres. Nurtured, protected, watched over. Biosphere Sentinel II, 23cm H x 48cm L x 28cm D.
Biosphere’s Guardian I, 22.5cm H x 22.5cm W.
Bela Fleck’s Throwdown at the Hoedown seems like the perfect title for this new Series and a fair way to honour all his music has given me, so I’m going to go with that for a while. This fascinating article by Randall Morris about Masks describes the process that I am trying to work through here. I have learnt a great deal from Randall since joining Cavin Morris Gallery. His amazing collection and beautiful writing brings clarity to, and pin points the essence of, what is important in art. I am an animist by nature and it is my job to portray what I see but the distractions can be over-whelming. Animism: informative article by Sarah Anne lawless. There is a ‘modern’ resistance/confusion to animist ideas. The waters are muddied by spiritualist ideas, religions and fantasies. It can be difficult to avoid distractions when you are working on this kind of sculpture. The process is intuitive and free-flowing. Expertise with well organised techniques allow for that by managing the clay’s weight and ceramic requirements leaving the maker and material to associate with minimal restraint. I’m not taking a political, moral or religious stand. I’m just doing my thing, same as always, doing my bit to get the sculpture made. That feels very important to me and I don’t need to know why. But none the less I keep informed on new science about consciousness in matter and enjoy the kinship and familiarity of Outsider art/ Art Brut. Having boundaries helps to weed out those irrelevant distractions. Within animism there are many practices used to engage and interact with the spirit world, to put it over-simply. I’m not attempting that. My role is just to be part of it. A record keeper, perhaps, a chronicler to help my fellow 21st century folk maintain a link with the natural world. How the Earth Made Us, a fantastic BBC 2 series by Professor Iain Stewart. 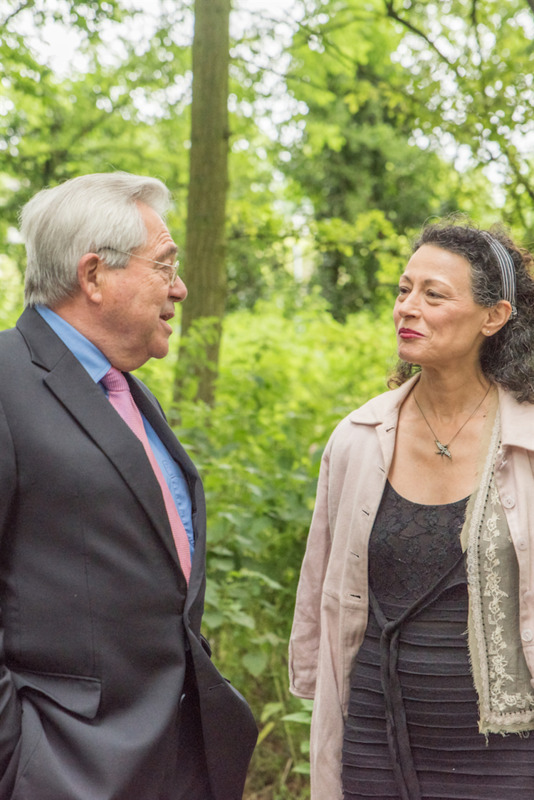 And some fab clips from another series, Earth: The Power of the Planet. Awesome iceberg video. I now collect these! Climate change info with a really interesting, informative video of leading scientist, James Hansen explaining the findings. –Naomi Klien‘s fascinating and very readable book, This Changes Everything and the exciting, optimistic organisation of the same name. –The Up is Down Series. 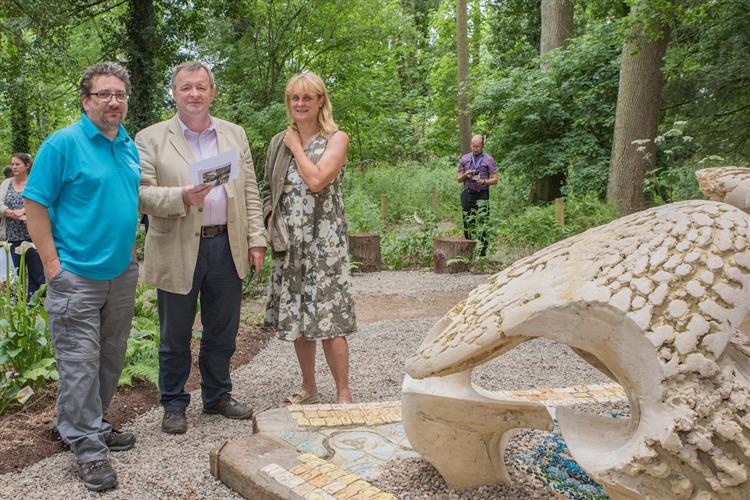 Thursday June 22 saw members of the Powys Teaching Health Board come together with artist Rebecca Buck, Veterans and Powys County Council Cabinet Ministers plus invited guests to officially open the Marking Time Sculpture and Woodland Walk. 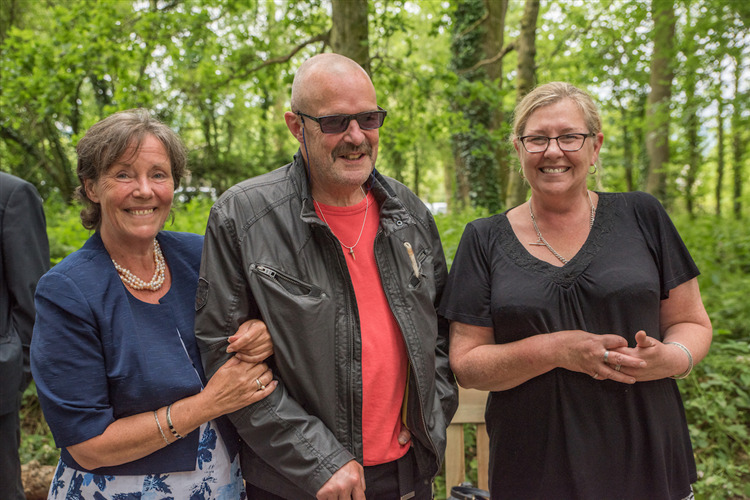 Along with The Green Valleys Organisation (TGV) the Powys Teaching Health Board (PTHB) has been working with and supported by Powys Forces Covenant to create a woodland walk which will allow patients, staff and visitors alike to take some quiet time in the small mature woodland adjacent to the hospital. 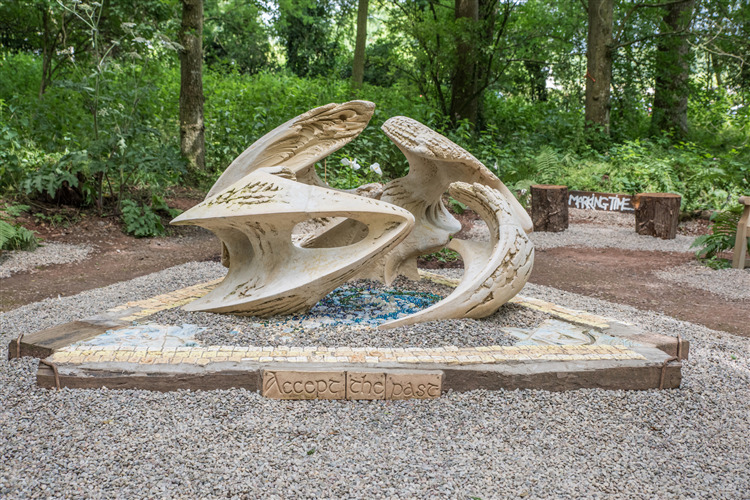 TGV working with forces Veterans over the past year have created a route through the wood featuring a large fired sculpture by Brecon Beacons artist Rebecca Buck. The project group also worked with children from two schools, Mount Street Primary in Brecon and Llandrindod High School, children from Mount Street Primary attended the opening and were delighted to see the fired tiles they had created in situ. 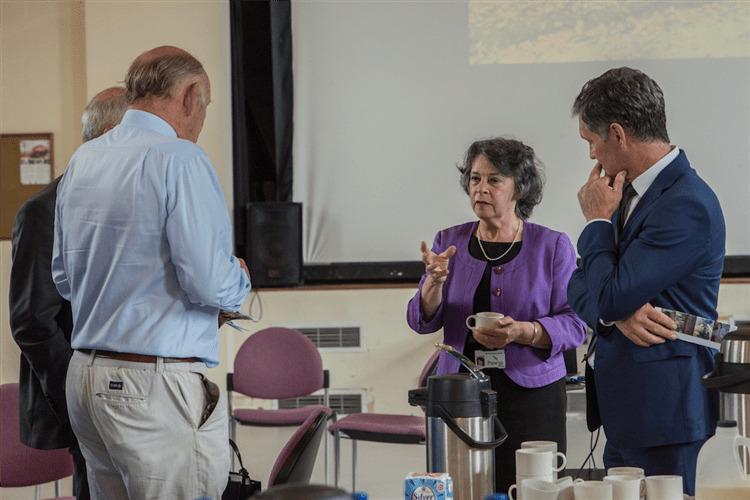 The event was opened by Carol Shillabeer Chief Executive of the Local Health Board and attended by Chair of the LHB, Professor Vivienne Harpwood, Vice Chair Melanie Davies. After an introduction and thanks to all working on the project, Veteran Mick Farrell gave a small speech of thanks to those who made the project possible especially volunteers such as Mark Christmas who has worked tirelessly on the project along with Gareth Ellis of The Green Valleys. 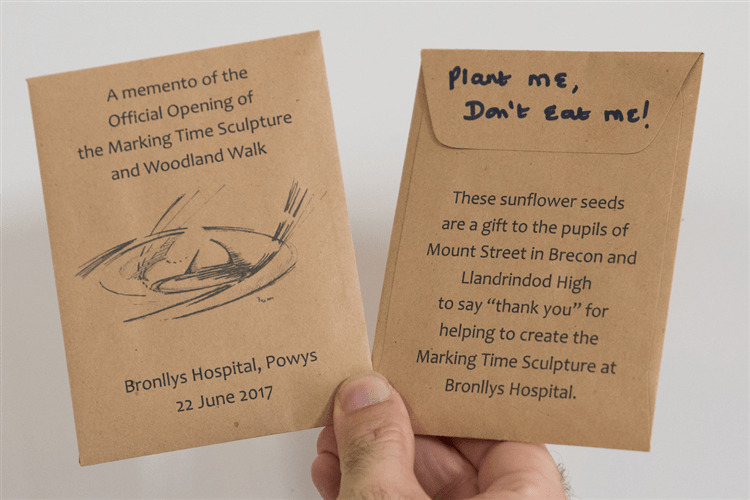 Many elements of the walk have come from other areas of the local community such as garden design by Seza Magdalena Eccles of ‘Hideaways in Hay’, poems commissioned for the walk from poet Emma Van Woerkom and Mark Christmas. 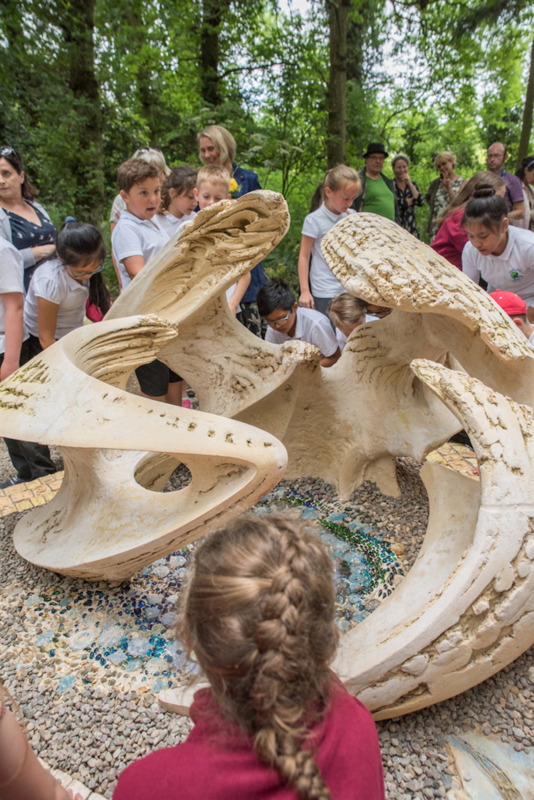 The mosaic which forms part of the sculpture was made by the children and the created tiles fit in and around the sculpture which were made and then cast in 3 sections. After some light refreshments and a display of the works, groups were led around the walk and the children from Mount Street joined the group for photos. Rebecca Buck the artist commissioned to make the sculpture which draws inspirations from Welsh icons such as Dragons and Red Kites gave and emotional speech. A poem which was written by Veteran Mick Farrell, especially for the Walk was read by Michael Eccles of Hideaways in Hay. 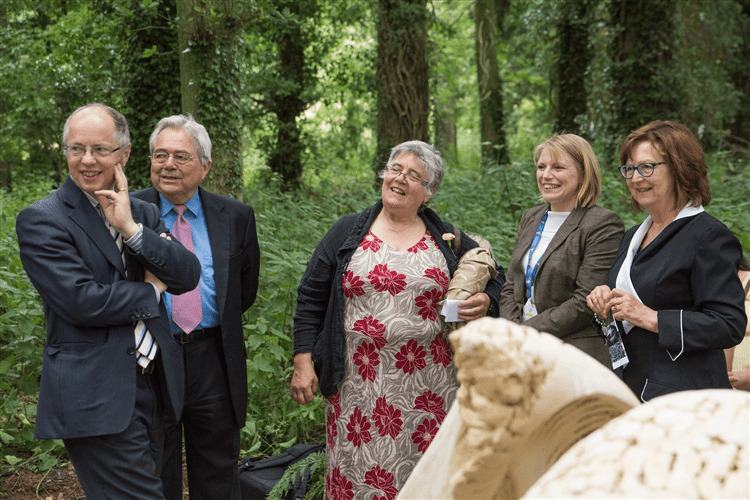 The sculpture is viewable in the ‘Woodland Walk at the Bronllys Hospital Site just opposite the Veterans ‘At Ease Garden’ created by the same Group. Garden Design: Seza Magdalena Eccles : http://hideawaysinhay.co.uk. Posted in Commissions, How to...step by step, Marking Time, the Bronllys Commission, Uncategorized. This Series is a collaboration with Photographer and Documentary Cameraman Stephen Foote. Click on any picture to see it full size. 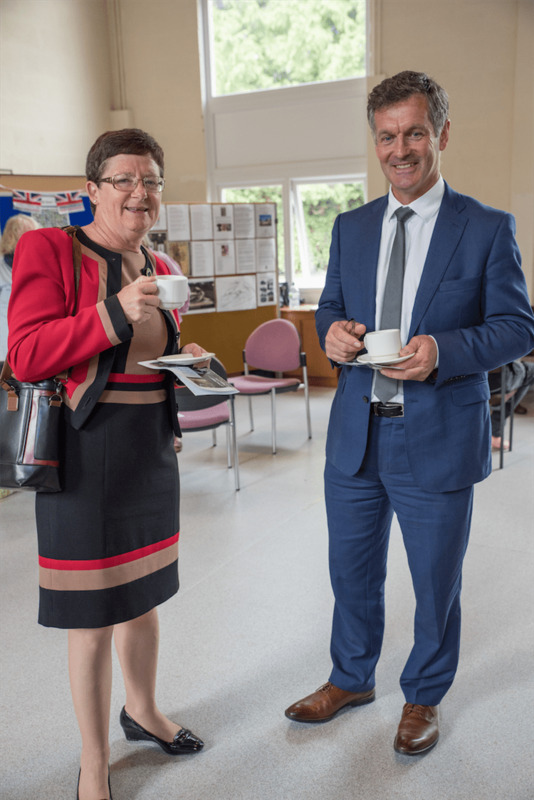 Stephen Foote and I met up after 30 years in 2014. We were good friends as teenagers, both rather disengaged with school, both making art in our own time. 30 years on we both still use art work as a major part of our interaction with this nutty world. Sharing our images was a key way we got to know each other again and harnessing that process in a joint project was simply a way of capturing what was occurring naturally. We set a straightforward ” Artists Respond to Landscape ” brief and kept a very open mind while we walked, talked, Steve took pictures and I just took it all in. We met every few months and sent each other pictures of the ensuing work in-between times. Steve is also a Cameraman and was involved in filming for Panorama during the early, very heated phase in Kiev and the Crimea. I was coming to the end of the Up Is Down Series . Our first visit was Bracelet Bay, Mumbles, Swansea. Then we went into Porth Yr Ogof caves and had a mind-blowing day for me; we spent hours in the dark, natural cave while Steve took a fab series of photographs. I stood in the river in the darkness, held the lights and listened to the flow of water, felt the under-ground breezes. From there the project clarified for us as the travels of the water from the sky above the Brecon Beacons to the river, especially the Tawe, on down to the wide bay at Swansea, and out into the Ocean where much of it will return to the clouds and begin the circle again. As it flows it leaves it’s mark on the stone, the ground, the life it passes. These pictures are roughly in sequence for the progression of work over time, with Steve’s photos next to the related sculptures in some cases. Wyvern, 10cm H x 18cm L x 11cm D.
Wyvern X, 21cm L x 12cm H x 11cm D.
Wyvern I in progress, July 2014. 68cm H x 64cm W.
Bracelet Bay, Mumbles, Swansea by Steve Foote. It was this fabulous picture of Bracelet Bay that shifted me abruptly into figures, much to my own surprise. The character of the Wyvern developed while making the public sculpture the Balarat Pit Marker in The Edge Series: the coal, a buried treasure to be used wisely or there would be consequences, watched over by a shape-shifting Welsh dragon. Wyvern busts in progress, Aug 2014. Here the Wyvern is a guardian of stone. Wyvern V, 2015, 27cm H x 51cm L x 25cm D, black ceramic. Cavin Morris Gallery, New York. Wyvern V, 2015, 27cm H x 51cm L x 25cm D, black ceramic. Cavin Morris Gallery New York. Porth Yr Ogof Cave, Brecon Beacons, by Steve Foote, 2014. We spent hours down here and as I assisted the photography, standing in the river and pitch black, I felt the underground wind and heard all the sounds of water travelling through the rocks. Extraordinary. A living, breathing world of unparalleled beauty. Wyvern II, 2014, 69cm H x 54cm W, x 31cm D, ceramic. Photo Stephen Foote. Wyvern VIII, 2015, 39cm H x 71cm L x 34cm D, ceramic. Cavin Morris Gallery New York. Wyvern VIII, detail. Photo Stephen Foote. Wyvern VIII, Cavin Morris Gallery New York. Photo Stephen Foote. Water moves from one sphere to the next in all it’s forms, changing everything it passes. On heavy, stormy days here in the Brecon Beacons it careens in sheets 10cm deep across the grassy hills, colliding in the streams and rivers to tear down towards Swansea Bay. It drops through the gaps and cracks it has left in the stone to the fabulous caves it has been cutting for Millenia. Standing out in the middle of all this you can see the mountain ponies, uncompromising, resolute and beautiful. They became the Guardian of the water, the Leviathan, in it’s mountain form. 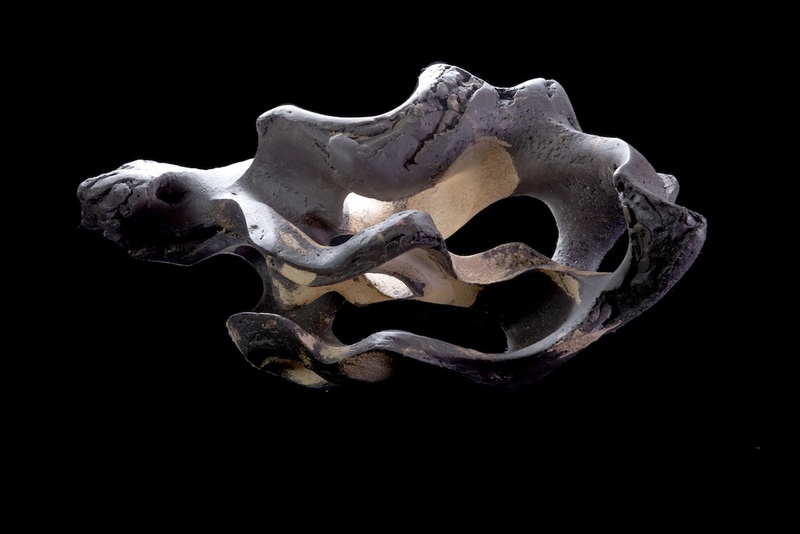 Leviathan V, 2015, 11.5cm H x 25cm L x 9.5cm W, ceramic. Photo Stephen Foote. Leviathan VI, 2015, 12.5cm H x 21cm L x 8cm W, ceramic. Cavin Morris Gallery New York. The Wyvern and the Osprey, 2014. The Osprey followed as the guardian of the sky. Osprey II, 65cm W x 50cm H. Photo Stephen Foote. Osprey I, 40 cm W x 25cm H.Photo Stephen Foote. Steve’s landscape photos unify everything exquisitely, portraying a vivid place with such clarity you can feel it around you. My sculptural response inevitably, and with some regret, separated the features which got me thinking more carefully about their connections. The sphinx-like form and majesty of the Brecon Beacons also showed up first in the Balarat Pit Marker. A classic sculptural motif, the reclining figure, with it’s many options for themes. Like the complex internal aspect of the Beacons complete with breath, life (water) running through veins in the rock, hidden secrets, moods, supporting of forests, wildlife, and us since the dawn of time. The subtlety of age: the Beacons are especially ancient and have been many things in their past. ‘The Land’ sculptures are about this part of what we saw. The Land II, 21cm H x 52cm L x 27cm D. Cupola Contemporary Art, Sheffield, UK. The Land VIII, 21cm L x 12cm H x 11cm W.
At this point the Series branches off into new territory lead by images and news about Climate Change rather than Steve’s photos and my local landscape. I have been following the fascinating progression of Climate Change for 35 years. At last it is a main-stream subject. It’s intriguing how people are still trying to avoid seeing it, the deniers but mostly the avoiders. My guilty secret is that I see it as thrilling: nature rejoicing in it’s power and spectacular magnificence, the wonder of transformation. Throwndown at Hoedown is an ongoing Series now. 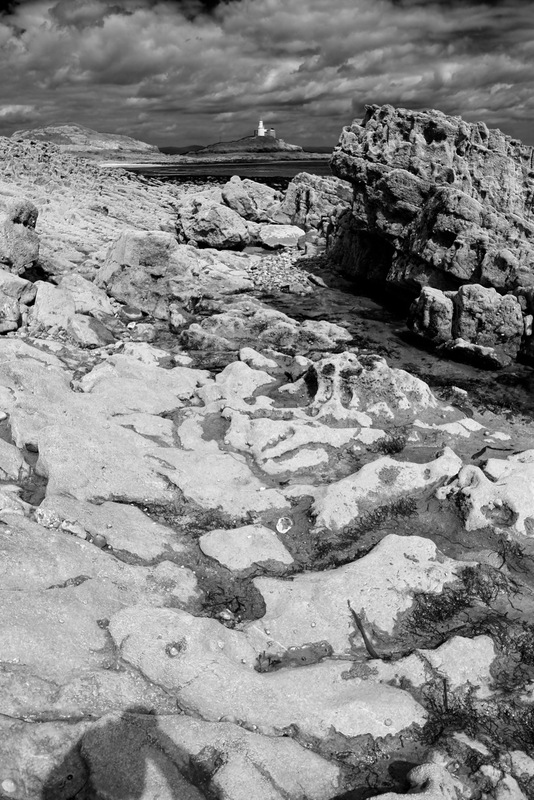 –The Up is Down Series proceeded The Landscape Series and was a transitionary point in how I put together forms, particularly in relation to their bases. The research involved clarified my thinking and ability to see. 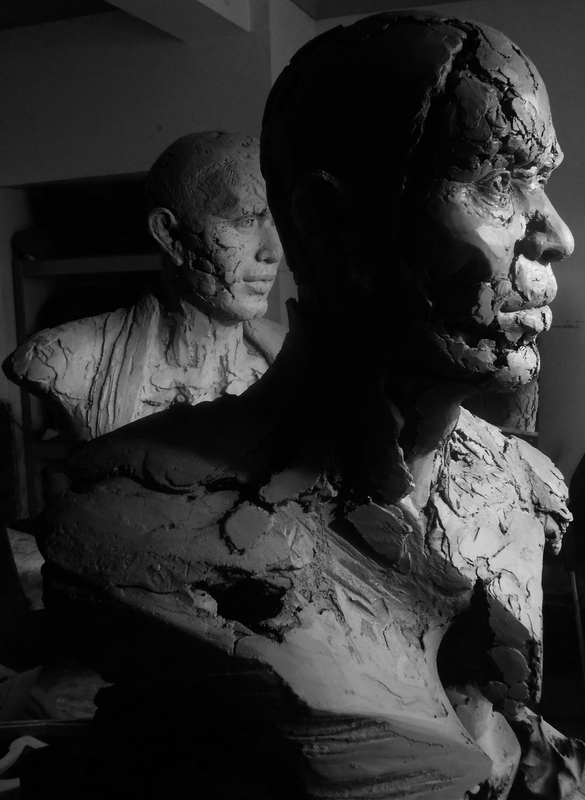 Most of the sculptures in The Landscape Series are built with the technique explained in Heads and clay armatures. Pennard Primary Lead Creatives Project, part 4. I am proud to say we have poured our hearts into this marvellous project. The amazing pupils, their awesome teacher Miss Bygate, the extraordinary Head Ms Hanson and all the dedicated, kind, thoughtful and very patient support staff were willing to really go for it and gave us all the encouragement and back-up we could possibly need. The final draft of the story The People of the Throne written by Pennard Primary School year 5, 2017, pupils and Daniel J Buck. Hidden with in this old business text book is the record of the whole project. Read Daniel’s description of the project from a writer’s view-point here. A great boost to have this kind and friendly Volunteer come along and rake over the foundation while we set the sections in place. The People of the Throne sculpture unveiled! The moment we have been working for! A nod from Ms Hanson and this sculptural playform is covered in excited kids at last! The pupils wonderful art work about what their character was doing during the story is set well into the coloured cement to protect it from play activity. This has given it a mysterious, ancient quality, like revealed carvings of a disappeared civilisation. During the design phase the pupils were clear that they wanted the sculpture to inspire other children to make their own stories. There are tunnels and hidden places. 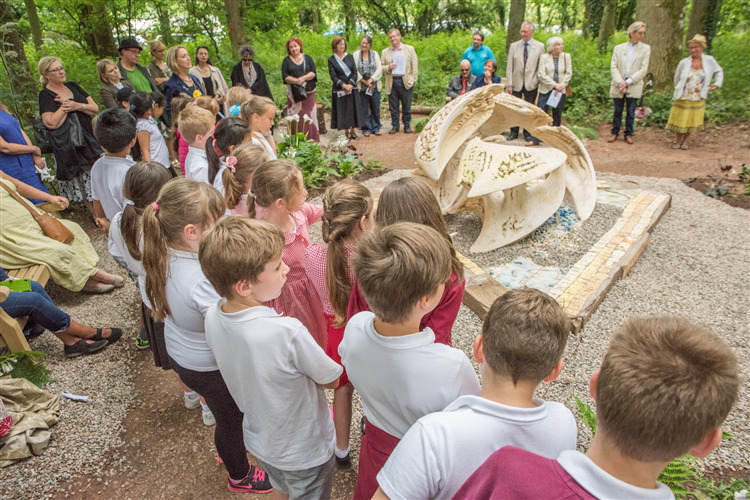 The sculpture is set facing the rising sun in a circle of established young deciduous trees, across from a big ground-work playform castle in the far corner of the huge play-ground at Pennard Primary School. This area is often used as an outdoor classroom and is a wonderful, magical, sheltered spot for free imaginative play. In the background, ever ready to step in and help is Hugh Blackwood, the school caretaker and artist who makes beautiful jewellery. He was invaluable during the installation, an out-standing assistant. It was a joy to see this amazing group again, show them their book and talk about their new ideas. The extraordinary Headmistress, Ms Hanson and some of her very proud pupils. The Throne, Pennard Primary School, Pennard, Gower, Wales, UK. By Osprey Studios and Pennard Year 5 2017. Year 5 had made us a fabulous card with drawings of each character. Kind, beautiful, creative and very dedicated Miss Bygate with her fabulous class and Daniel on the sculpture they have made with Osprey Studios for every future generation at their school.